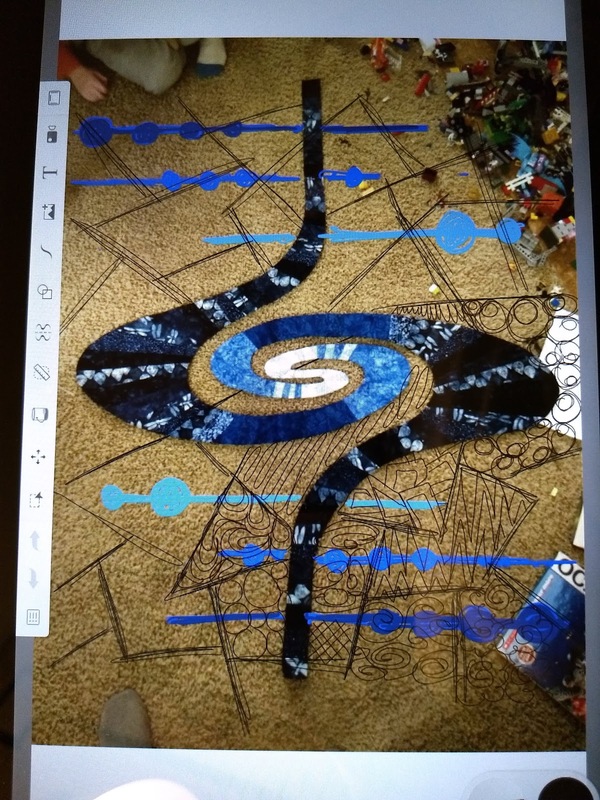 I've been working on this Whirligig quilt using Island Batiks Indigo Morris collection for the last few weeks. It's finally done and I'm excited to share it with you! 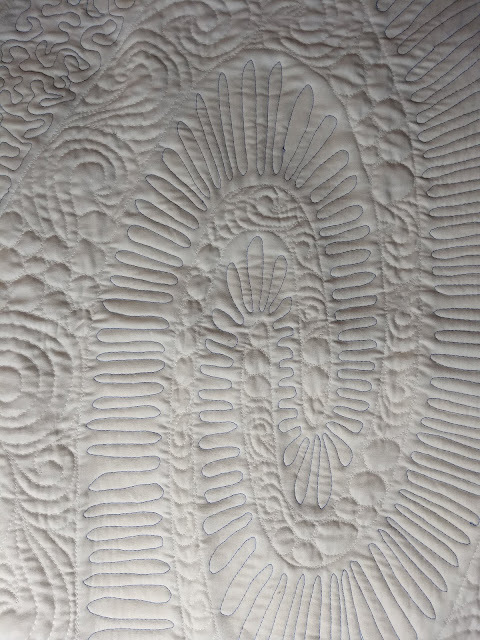 I've been learning to use my new Chrometab with pen and I find drawing on my quilt pictures a great way to get to know it and to sketch out quilting ideas. In the photo below you can see me using it to draw in the blue lines with circles I appliqued down. In addition, there are some black lines that I was planing on doing as part of the framework of the quilting. I was excited to get started. And then I changed my mind. I decided to do one fill in the background instead of the framework. Why? I'm not sure, but that's the way I went. I used large swirls and bubbles. 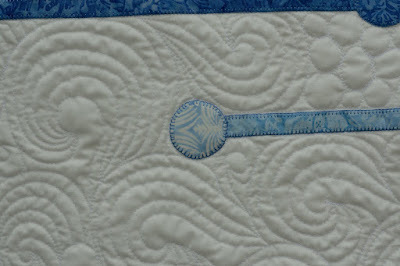 HOWEVER....(here comes the tip)....I quilted the background before I did the quilting in the blue. Why? Well, I put the white thread in to outline all the pieces and then I just went for it. OOPS! DO NOT QUILT THE BACKGROUND BEFORE YOU QUILT THE MOTIFS! OOPS! 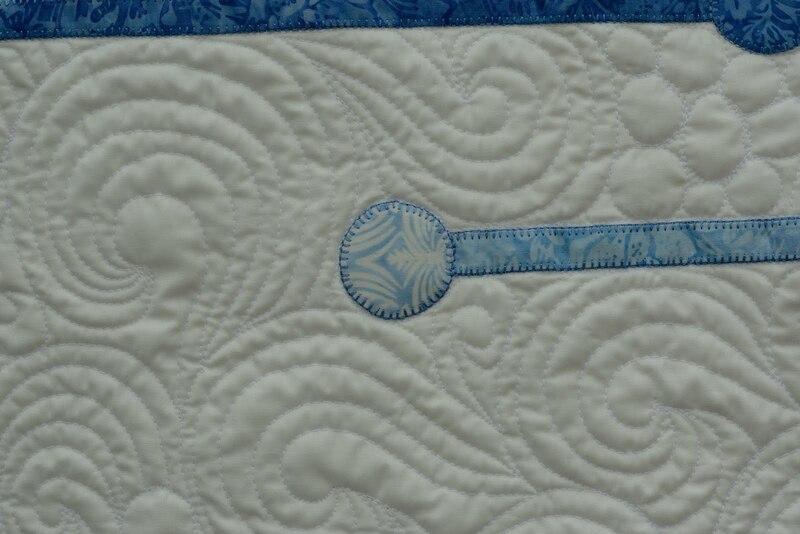 When I went to quilt the blue in the center, it had bubbled some and wouldn't lay flat. OOPS. What to do? 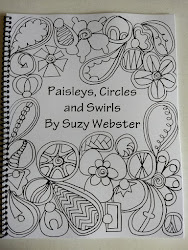 I was planning on doing the curvy line/matchstick quilting you see below through the whole whirligig. However, as I got to the larger parts on the sides it began to bubble in a way that I knew was going to cause a colossal (at least an inch) pucker. Not going to work. So I started thinking about fills that can help eat that excess bulk. 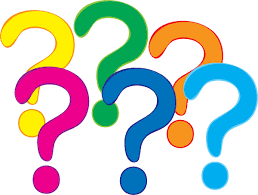 The best ones? STIPPLING also known as meaner, or PEBBLES. I didn't want to pebble since I'd already done that in the background so I decided to do a large scale stipple. It worked perfectly. 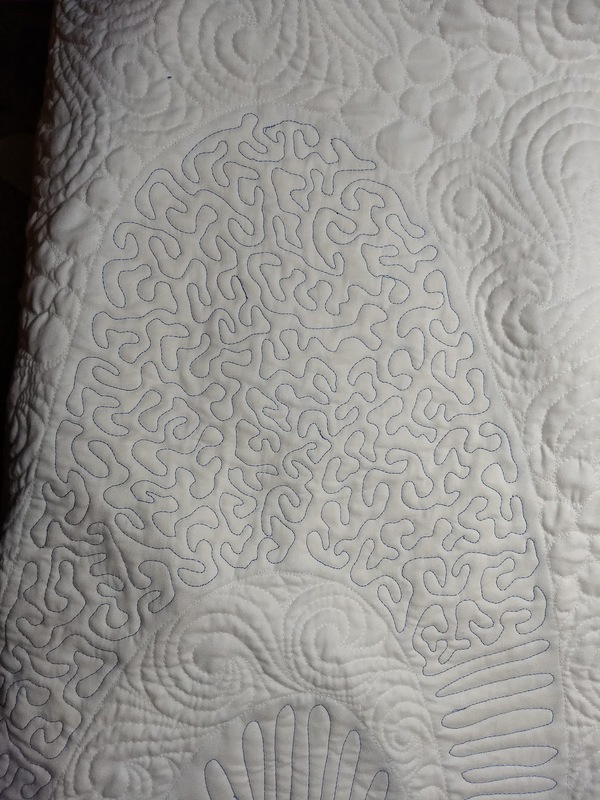 I was able to smooth out the quilt and it looks great. Here is Whirligig all finished. I'm really happy with it and now to get her entered! Good save on that bubble area. I usually panic at that point and end up with at least one tuck. Oh I made that mistake once. Not having done appliqué for years and never quilting appliqué on longarm I had not idea that would happen. 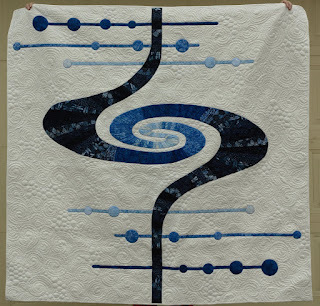 Fortunately it was a scrap quilt so it was not a huge loss. My doctor loved it by the way. Yours looks great, good recovery. Just reading about the pucker makes me practically hyperventilate. Haha! Glad you came up with a good solution. I absolutely LOVE your quilt. It's so cool. You have done a great job on all of it, including the quilting.